A big name in cast or crew can be life-changing for any film. One name could be enough to boost public interest, attract big distributors at an early stage, or even ease the way to some important awards. When it comes to animated films without a big cast, no doubt the producers and talent attached play a huge role. In case of “The Breadwinner”, there are several names to be mentioned. Firstly, Angelina Jolie is one of the producers of the film – how awesome is that! And once you know what the film is about, you’ll understand that there would not be a better producer to care more about such an important story. I’d like to bring to your attention two other names. The other producer of the film is Tomm Moore, known to fans of animation for such infamous films as “The Secret of Kells” (2009) and “Song of the Sea” (2014) – both films bringing him Academy Award nominations. The director is Nora Twomey, also known as the co-director of “The Secret of Kells”. And I believe visually, “The Breadwinner” continues the best traditions of both films. 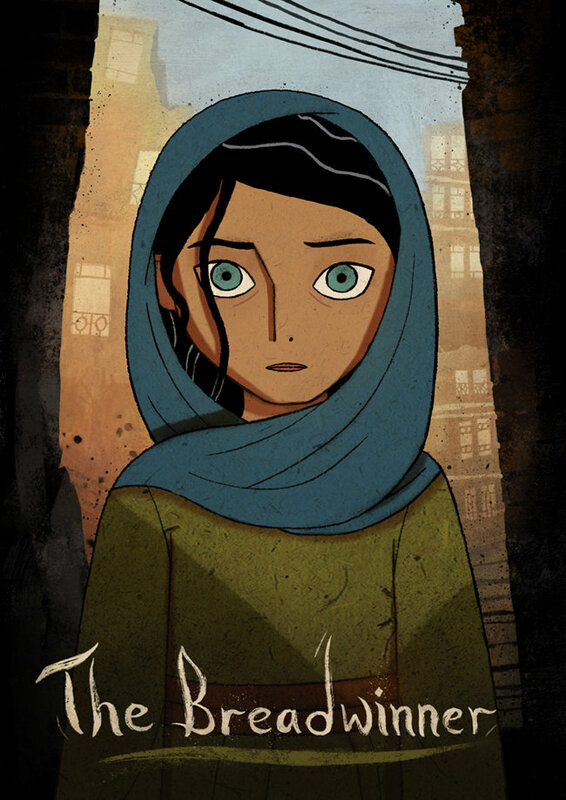 Set in Kabul, Afghanistan, the film tells about the young girl Parvana and her family who live under Taliban regime. What does it mean to live in a country during wartime? What struggles does a young girl face in a society where women are oppressed? And eventually, what kind of courage does it take for a girl to become the caretaker of her family in such difficult times. When Parvana’s father is imprisoned, the family meets the harsh reality, where a woman is not allowed even to go to the market to buy bread. She sees no other solution but to pretend to be a boy so that she can go to the market and provide for her family. Her bravery is fascinating and her journey – a true inspiration. She knows her decision is putting at risk not only her life but also of everyone else in her family. To keep the spirit up, she comes home and tells wonderful stories to her little brother. Eventually, Parvana learns that there is a chance to free her father. Dressed up as a boy, the little girl goes to face the hardest challenge in order to reunite her family. With such a relevant concept and beautifully made animation, “The Breadwinner” refreshes people’s memory of what is happening in some other parts of the world. It highlights the struggle of women under such tough regime as the Taliban, and shows the injustice they have to face on a daily basis. I believe that is one of the factors that makes “The Breadwinner” one of the most interesting and important films of the year. In conclusion, “The Breadwinner”, of course, is not a fancy big-studio animation. It’s not a Disney or Pixar type of a film. Yet, there is something about it that won’t stop charming the viewer. It’s profound, heartwarming and so real. Also, it is a film that little children can watch and learn about serious things that happen in another country. “The Breadwinner” teaches us to appreciate and care about family values. Finally, it reminds us that nobody but you, me and everyone else can stand up to protect our loved ones – no matter whether we live in war or in peace.